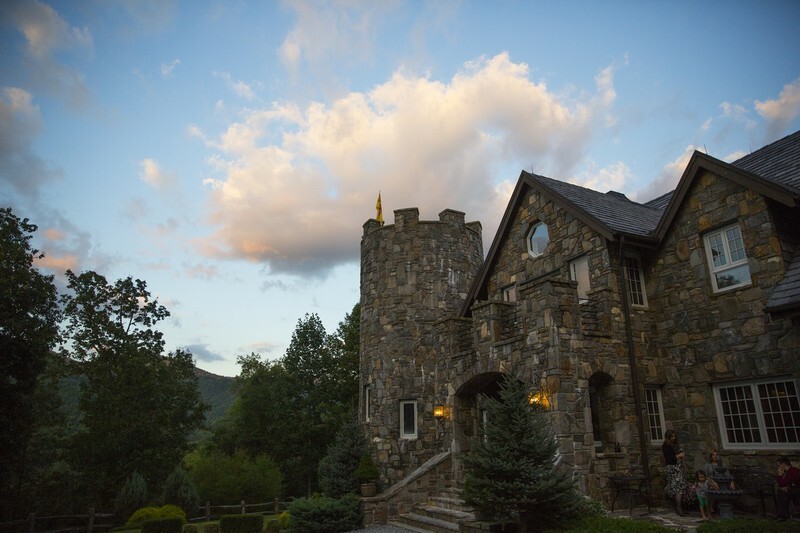 An Authentically recreated Scottish Border castle in the center of a sixty acre gated estate. Our many patios and balconies offer spectacular mountain views, as do our garden ceremony sites. Our Great Hall with it's soaring timber frame offers a spectacular site for indoor ceremonies as well as reception activities. Full day venue rental on the weekends ensures complete privacy for your event as you are the only wedding that day. It also offers a relaxed atmosphere for pre-ceremony preparations in our lavish bedroom suites, or casual entertainment in our billiard's pub. Five hour venue rentals offered midweek provide an affordable alternative to the budget conscious bridal couple. Best for event of under 200 guests, Castle Ladyhawke also offers on estate guest housing in our medieval styled Fable Village and whimsical Gypsy Camp, or even in the castle itself. Only one hour from Asheville, yet you'll feel like you stepped back in time. The castle offers it's own rental inventory and an extensive list of talented recommended area vendors, but welcomes all outside vendors to perform services at the castle for our mutual clients. Attentive and expert staff make your planning experience enjoyable and stress free. Elopement packages also available.